Medium sized traditional bedroom in Gloucestershire with beige walls, carpet and grey floors. 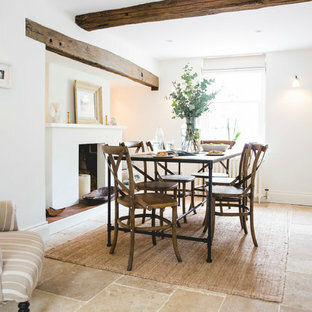 This is an example of a farmhouse dining room in London with white walls, a standard fireplace and beige floors. 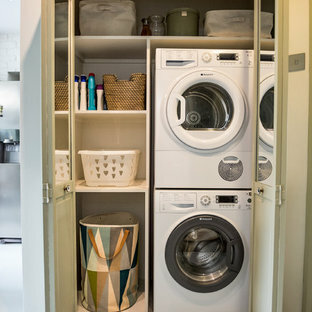 Photo of a small bohemian single-wall laundry cupboard in London with open cabinets, white walls, concrete flooring, a stacked washer and dryer, white floors and white worktops. This is an example of a medium sized contemporary back patio in London with a potted garden and natural stone paving. 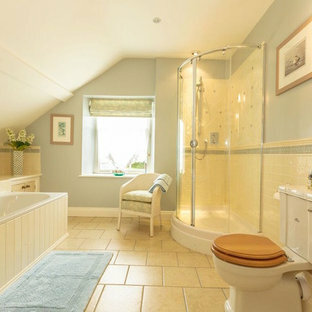 Design ideas for a country ensuite bathroom in Devon with a built-in bath, a corner shower, a two-piece toilet, beige tiles, blue walls, beige floors and a sliding door. No matter how big your kitchen, it is always the place guests will congregate at a party. If you enjoy hosting dinner parties then there are some key kitchen design elements to consider before creating a kitchen perfect for entertaining. The clean, contemporary lines of this kitchen design is simple and uncluttered – the perfect backdrop for a cooking and entertaining space. Luckily our client thought so too... "Ultimately I ended up with my dream kitchen. I am absolutely delighted with the finished article and it works perfectly - better than I had imagined." 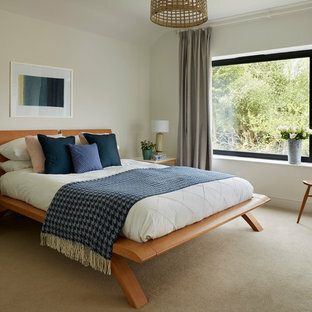 This is an example of a medium sized contemporary master bedroom in Wiltshire with white walls, carpet and no fireplace. 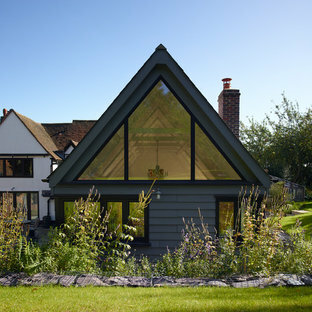 Photo of a gey and medium sized traditional one floor detached house in Hertfordshire with wood cladding and a pitched roof. Small victorian bathroom in Hampshire with a wall-mounted sink, a built-in bath, a two-piece toilet, multi-coloured walls and light hardwood flooring. 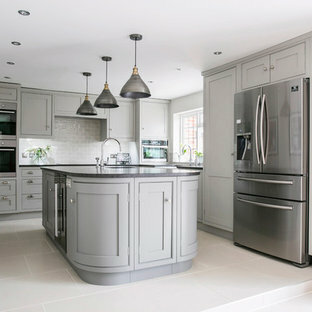 Photo of a contemporary kitchen/diner in Oxfordshire with a submerged sink, flat-panel cabinets, medium wood cabinets, an island, beige floors and white worktops. Photo of a medium sized contemporary study in London with white walls, light hardwood flooring, a freestanding desk and no fireplace. 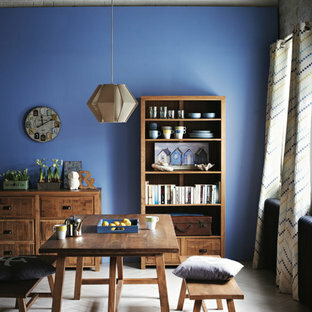 An open plan living room with incredible storage, light wooden floors, high ceilings and finished with high standards. This fabulous flat is part of E8 Developments portfolio. This show flat has been decorated with gorgeous luxurious furniture and furnishings by Casa Botelho and photographed by Moon Rei Studios. Small contemporary guest bedroom in Oxfordshire with grey walls, carpet and beige floors. Bohemian galley kitchen in New York with a submerged sink, green cabinets, stainless steel appliances, light hardwood flooring, no island, beige floors and recessed-panel cabinets. Photo of a contemporary master bedroom in London with white walls, medium hardwood flooring and brown floors. Inspiration for a traditional kitchen in Other with engineered stone countertops, grey cabinets, beige floors, glass-front cabinets, grey splashback, black appliances, light hardwood flooring and an island.